Fiberglass laminate construction. Stern deck extends 16 inches forward of transom. Wood splash rail on bow deck with triangular wood block at center joint. Fitted with non-tapered masts. Narrow width centerboard trunk (3/8" wide). Originally fitted with steel centerboard (˜ 60 lb). Some boats may have been retrofit (or possibly original) with aluminum centerboards. Wire centerboard pennant lead to a shaft with 10" diameter drum for mechanical advantage. No bow tank. Seat/side tank combination constructed in fiberglass. Metal hoop traveler- 14 inches wide mounted on transom. 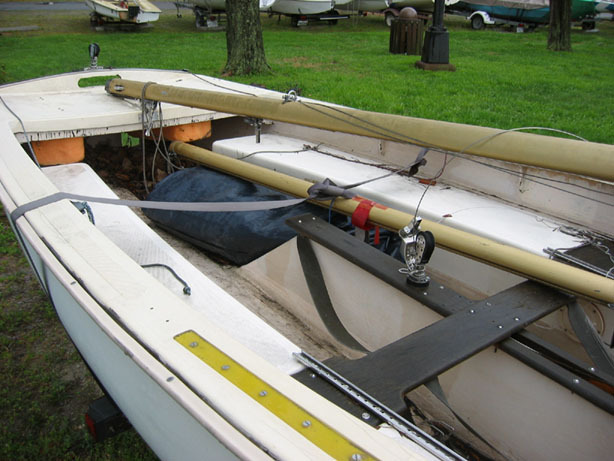 Standard rig was an untapered aluminum mast and boom. Fiberglass laminate construction. Stern deck extends 16 inches forward of transom. Fiberglass splash rail on bow deck. Fitted with non-tapered masts. Full width centerboard trunk (1" wide). Originally fitted with aluminum centerboard (˜20 lb). Wire centerboard pennant lead to a shaft with 10" diameter drum for mechanical advantage. Many boats retrofit with home made wood centerboards. 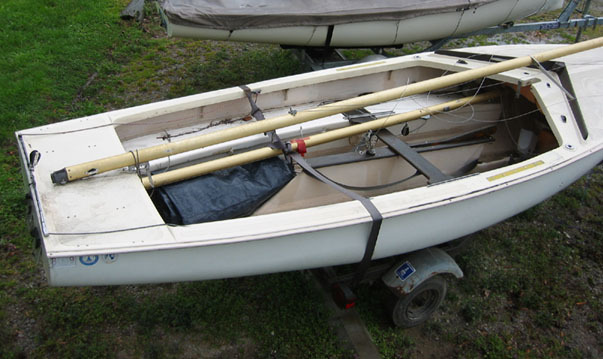 These boats were built with wood thwarts and centerboard cases as shown in photo below. Seat tanks extend from bow deck to stern deck (not full length).